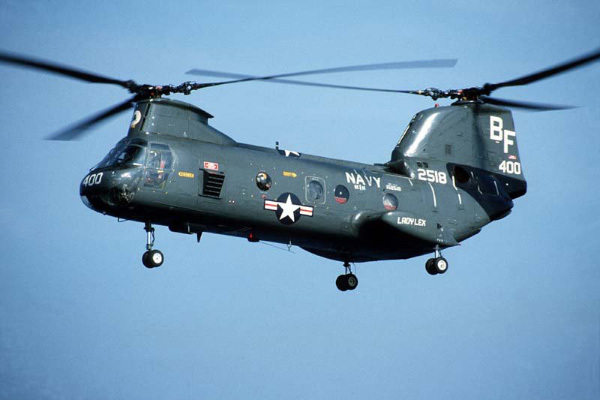 The Boeing CH-46 Sea Knight is a medium-lift tandem rotor transport helicopter, used by the United States Marine Corps (USMC) to provide all-weather, day-or-night assault transport of combat troops, supplies and equipment. Assault Support is its primary function, and the movement of supplies and equipment is secondary. Additional tasks include combat support, search and rescue, support for forward refueling and rearming points, CASEVAC and Tactical Recovery of Aircraft and Personnel (TRAP). The commercial version is the BV 107-II, commonly referred to as simply the "Vertol". Two General Electric T58-GE-16 turboshafts, 1,870 shp (1,400 kW). Two XM218 .50 BMG (12.7 x 99 mm) machine guns (optional), 1 Ramp mounted M240D 7.62 x 51 mm machine gun (optional).